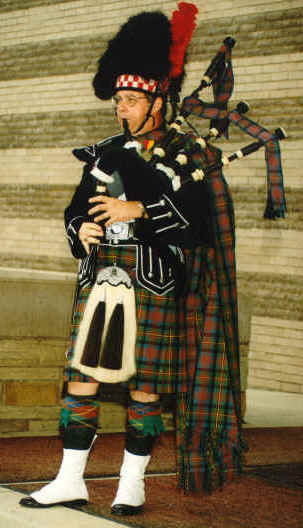 Bagpipes....the name alone conjures up visions of misty glens, deep lochs and mystical tales of the Old Ways. The bagpipes were a part of everyday lives of the Celts and their distinctive sounds were readily available to celebrate any special occasion. Add something unique to your special day. Add the memorable strains of the Great War Pipes of the North. Donald will appear in either formal, medieval, or full 19th century Scottish Military Dress Uniform. Small pipes available by request. It's 1957 and Fairvale, Ohio is preparing to celebrate the 50th anniversary of its annual Scottish Highland Games. 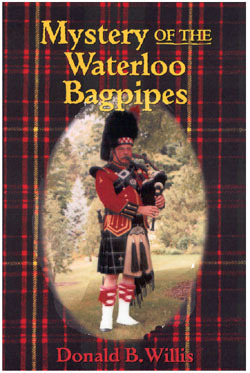 As a focal point to this year's special celebration is a valuable set of bagpipes that were played at the battle of Waterloo. One stormy night prior to the start of the Games, the pipes are stolen, and five young members of the local pipe band take it upon themselves to rescue the historic artifact. Their dangerous quest ultimately leads them into a direct confrontation with an adversary, so patently evil, they literally must fight for their very survival. "In his first novel, Mystery of the Waterloo Bagpipes, Donald B. Willis has woven a story that will intrigue readers, both young and old alike." "An interesting story with an exciting, fast paced surprise ending. I thoroughly enjoyed it." In this long awaited sequel to Mystery of the Waterloo Bagpipes, Donald B. Willis transports us back to the small, rural village of Fairvale, Ohio. It's 1959 and Jamie Murdoch and his friends are hot on the trail of a legendary treasure purportedly buried by a detachment of French soldiers two-hundred years earlier. Unaware that a powerful, evil force has returned to town, Jamie once again finds himself in a brutal life or death struggle with a former adversary whose sole existence is motivated by one driving passion that when unleashed results in an unforgettable climax, both shocking and gruesome. Interestingly enough, Fairvale, Ohio, although fictitious by name, is actually based on my hometown of Minerva, Ohio. The story of the Lost French Gold is factual and the treasure is reported to still rest undiscovered somewhere outside of town. Several attempts have taken place over the years to locate the hidden wealth, but all efforts have ended in failure. ~ "Wow! And I say again; Wow! What an exciting book! Donald Willis has a real knack for building suspense. I loved the story." 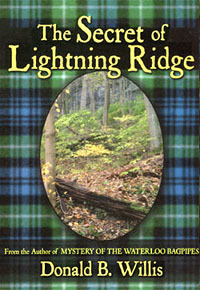 Scott Williams - author Sandy Chisholm's Chanter Lessons, New Bagpipe Music from Nova Scotia - Vols. 1-4, Pipers of Nova Scotia-1773 to 2000, and Pipe Bands of Nova Scotia. ~"Donald Willis has piped another bonnie tale from his vivid imagination. Mixing a wee bit of history along with a generous supply of whimsy has resulted in a fitting sequel to Mystery of the Waterloo Bagpipes. It's a refreshing journey back to simpler times where the pace of living makes us yearn for the 'good old days'. . .or were they?" It's 1957 and thirteen year old Calvin Hemingway is torn between two career goals--being a world-renowned author like his literary hero, Ernest Hemingway, or a small town funeral home embalmer like his father. 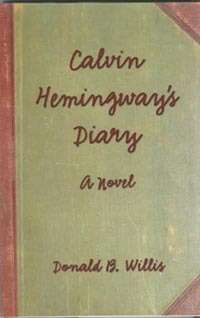 Given the opportunity to read the weekly diary entries kept during one summer vacation, the reader gets to enter the curiously strange, sometimes bizarre, often hilarious, but never dull mind of a young boy whose strangely fertile imagination makes even the most mundane tasks a thrilling adventure. "Reading this was like watching a train wreck. I was afraid to look away for fear I'd miss something. I'm sorry I didn't." --Jim Lewis, Fireside Books, Chagrin Falls, OH. "This was the stupidest book I ever read. I laughed 'til I gagged." --KAW Reviews. "Outrageous! We are self-righteously offended!" --A Politically Correct Action Group. "Where did I go wrong?" --Former English teacher.